Many of you already greeted the autumn season and began to bake various apple pies and cook hearty dishes. Autumn signs have been also trickling into Dubai, but slowly and it is still summer-like days here with plenty of strong sunshine during the day-time. Mornings and days, though still warm and sunny as usual, have been followed by lovely and cool evenings. Despite of all hot days, it’s a big advantage of living near the Gulf: we can enjoy the sea and sand any time over the year long. That’s what we did one afternoon – went to a beach. But before the joy of swimming in the sea, I prepared a very simple, light and fresh, and crunchy salad. 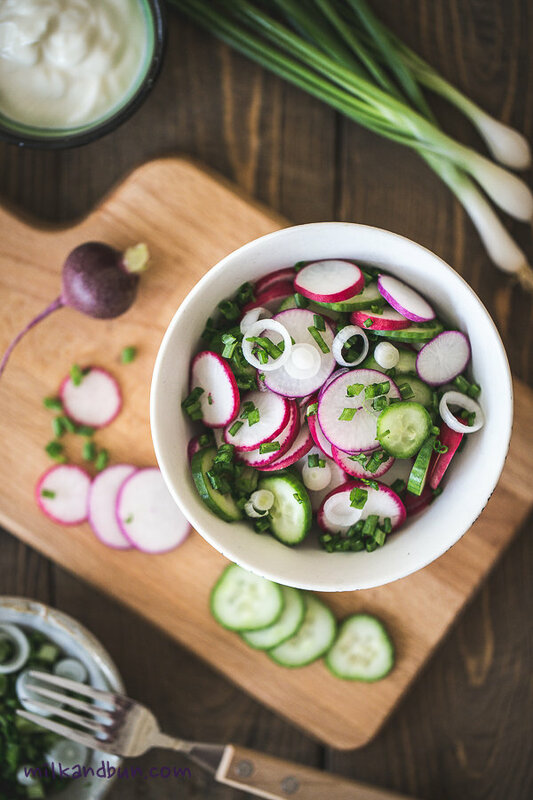 It needs only few ingredients including beautiful radishes, which I found at local supermarket and just couldn’t resist picking up a huge bunch. 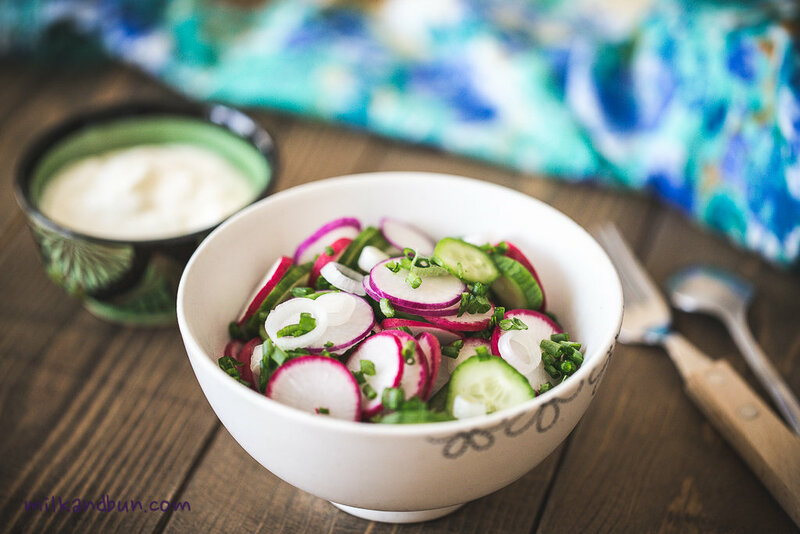 As you can see, the recipe is V-E-R-Y simple: all you need is love, fresh sliced cucumbers and bright radishes, chopped spring onions, some seasoning and sour cream! I like this salad. 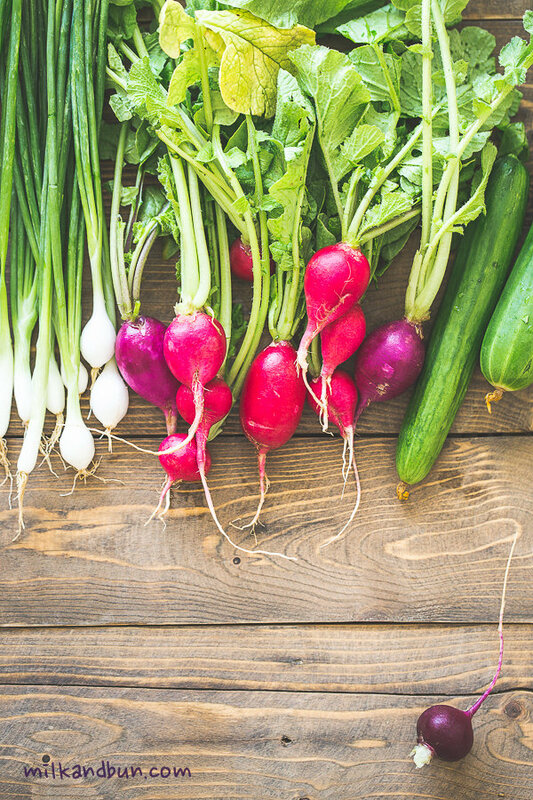 It reminds me summer holidays: staying at parents house, fun of gardening and eating lots of fresh veggies and berries. And for that reason I decided to mix up vegetable slices with traditional Russian dressing – sour cream, instead of olive oil. Simple and well-loved. Be generous with spring onion! You may also add some chopped dill, if you wish. I discovered crumbles not long time ago, but immediately fall in love. Thank to the British for this amazing, simple and absolutely delicious dish! I’ve already tried various sweet crumble recipes – with peaches, mixed berried, pears.. I love them all! But.. Once I stumbled upon a new crumble recipe by James Martin, he is a well-known English chef; the recipe called for plums, spices and wine. And what do you think – it’s the best crumble I’ve ever made and tried! 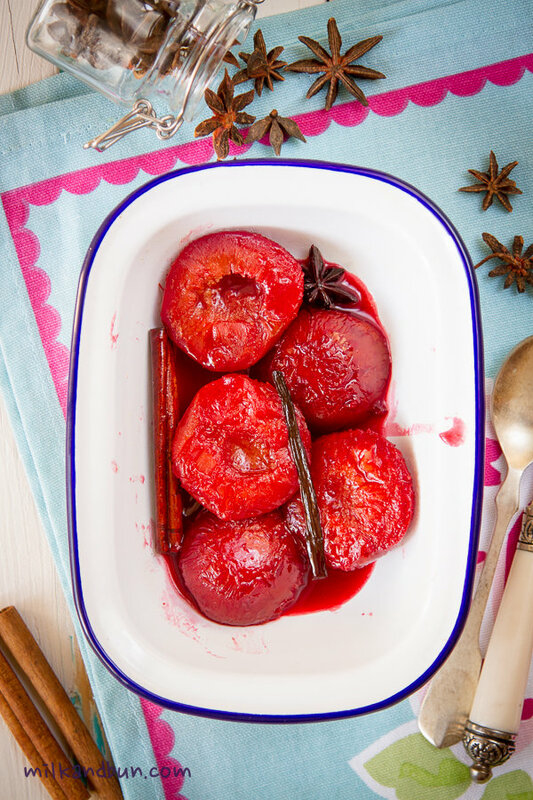 Plums with spices sautéed in red wine remind me mulled wine, and it’s incredibly tasty! This crumble is very aromatic and delicious even without ice cream on top! I slightly adapted the recipe – added oats and chopped nuts, walnuts and/or pistachios is a nice crunchy addition here. Heat the butter in a pan over medium heat. Add the plums and fry for a few minutes. Add the split vanilla pod, star anise, nutmeg and cinnamon stick to the pan. Add the water, red wine, honey and sugar and bring to the boil. Reduce the heat and simmer for 5-6 minutes, until the plums break down to a thick sauce. Transfer plums with sauce to one or 2 individual baking dish. For the crumble topping, mix the flours and sugar together in a bowl. 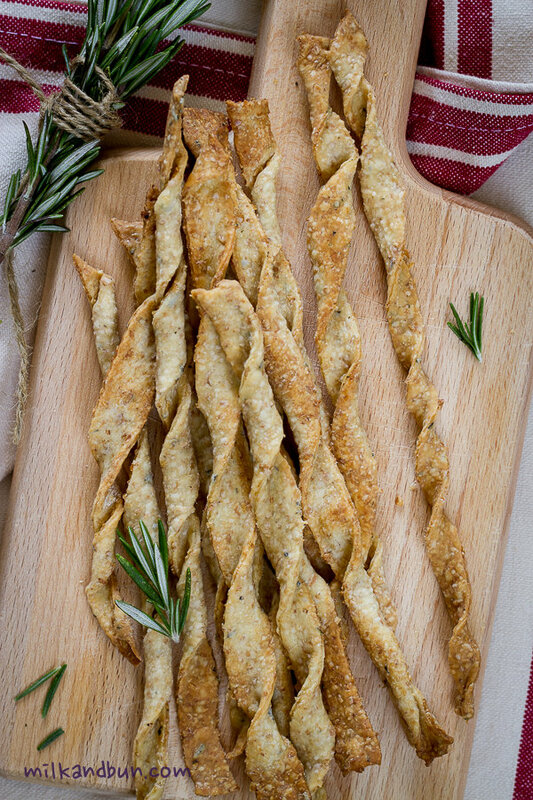 Rub in the butter with your fingers until the mixture resembles breadcrumbs. Mix in chopped nuts. 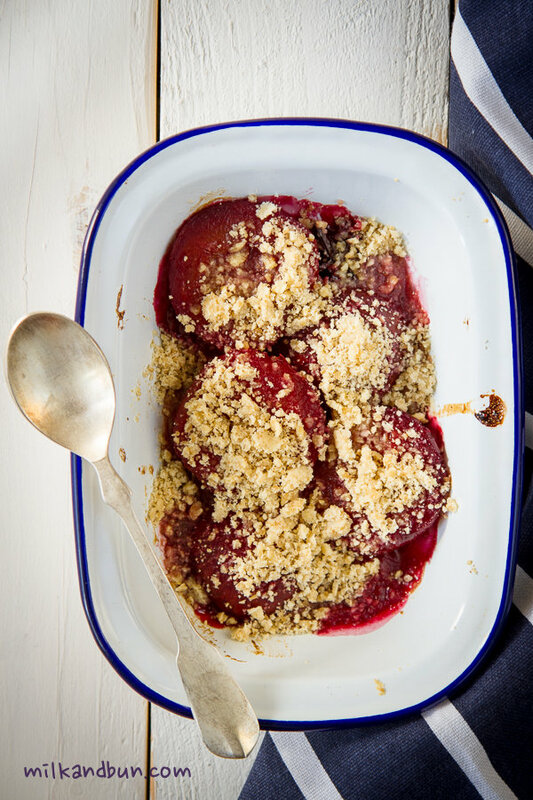 Sprinkle the crumble over the plums and bake in the oven for 20-25 minutes, until golden-brown. Remove and allow to cool slightly before serving with ice-cream.